The holiday season is a time of celebration and fun – even for family pets. Cats and dogs will often think that the things we bring into our home during this time of year are especially for them. From dogs “marking” Christmas trees to cats running around with tinsel, all of these holiday decorations have the potential to become hazardous in their own way. Some of the most dangerous decorations in the home during the holidays are plants. Seasonal pet tips can help you know what to avoid during this time of year. You might be surprised to discover which plants are considered toxic for cats, and which ones are actually safe. That being said, if your cat likes to eat or chew on plants, you may be better off keeping all plants out of your home year-round. Don’t expect that a plant up on a high shelf is safe from a cat. If your cat wants to get at something, he or she will. Southeastern Massachusetts pet owners should pay attention to their cat’s behaviors and curiosities so they can do everything they can to create a safe environment within the home. 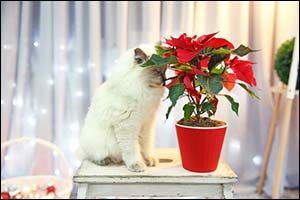 The holiday plant that gets the biggest rap in seasonal pet tips for being dangerous to cats is the poinsettia. However, when compared to other plants, the poinsettia is actually the least harmful or toxic. Studies now show that poinsettia range from non-toxic to mildly toxic, depending on the variety. If a pet ingests poinsettia, they will typically have no physical signs of distress, illness or even digestive problems. In some cases a rash can be seen if the cat repeatedly rubs on the leaves, but for the most part, poinsettia are safe to keep in a home with a cat. The debate between getting a real or artificial tree for the holidays usually has more to do with allergies or concerns regarding kids and pets than the mere convenience of having a tree in a box. However, when it comes to pets the only thing you need to be worried about with a natural Christmas tree is the potential damage that could come from a pet running into a tree and getting an injury to their eye. Pets that lick or eat sap from the pine tree might have some stomach pain, but for the most part, natural trees are non-toxic for both dogs and cats. If your pet does experience an eye injury, make sure to bring them to your Dartmouth emergency vet for an evaluation right away. One holiday favorite that you might want to substitute with an artificial replacement is mistletoe. This plant is very poisonous to pets and, if ingested, can show clinical signs of poisoning, including difficulty breathing, low heart rate and a change in mental function. It can also cause severe gastrointestinal upset. If you know your pet ingested mistletoe, make sure to bring them in for an exam right away, even if you aren’t seeing any symptoms yet. If you do see any of these symptoms in your cat, whether you think they ingested a plant or not, bring them to your local Dartmouth emergency vet. Anchor Animal Hospital in Dartmouth is a veterinary clinic and emergency facility, providing care for Southeastern Massachusetts pet owners and their pets since 1975. Some of the other plants that you see around the holidays that can be dangerous for pets include holly, Amaryllis and daffodils. Lilies can also be incredibly toxic. Clinical symptoms to watch out for include diarrhea, vomiting, lower energy levels, upset stomach, a loss of appetite, painful abdomen and even depression. Depending on the pet, the size of the pet and the amount of the plant that was ingested, it can quickly become a case of severe toxicity. Ingestion of any part of the lily plant can cause kidney failure. Make sure you get your cat to the animal hospital in Dartmouth right away if you suspect they have ingested any part of a lily. Contact Anchor Animal Hospital in Dartmouth by calling 508-996-3731. You can also visit our location on State Road during office hours. If you need a Dartmouth emergency vet after hours, contact our office for information on other reputable pet hospitals that we work with who can provide care for your pet. Southeastern Massachusetts pet owners should be aware of all seasonal pet tips to help provide proper care, nutrition and preventive services for their pets year-round.